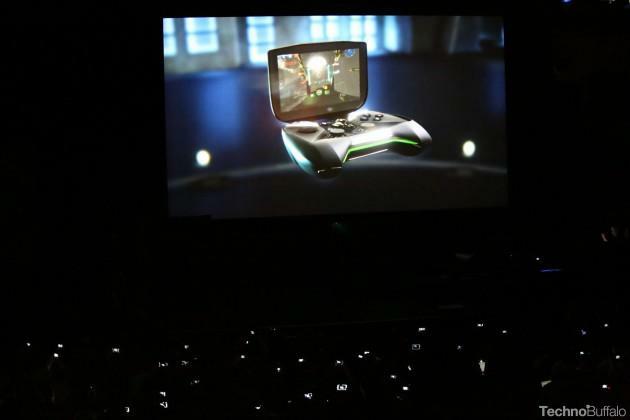 NVIDIA took the stage at CES 2013 and just unveiled a gaming controller with a Tegra 4 chip and a full 5-inch screen for gaming. The device is currently dubbed Project Shield. It’s basically a complete portable gaming platform with 5-8 hours of gameplay that’s developed by NVIDIA. It runs Android games and uses the Google Play and TegraZone game stores. In other words, it runs a pure version of Android. Once you hit the “Shield” button in the middle, it goes into Shield mode, and if you hit it again it jumps back to a pure Android device. The audio is also supposed to be incredibly impressive and is on a par with Jambox portable speakers. The gamepad includes dedicated analog buttons, joysticks, triggers, bumpers and more. It also supports 24 hours of high-definition video. So what about the ports? It uses industry standard I/O ports including a microSD slot, microUSB and HDMI-out. NVIDIA hopes consumers own several in each household and that consumers customize the look of the device with what it calls “tags,” which basically look like skins. We had a chance to see a demo of the device, even playing 4K video and games out to a 4K TV, and it was able to handle it without an issue. Amazingly, it will even allow users with PCs running NVIDIA GTX graphics cards to play games from Steam on the device. Dang, we really want one.